Connla was the son of Conn of the Thousand Fights.Connla was a handsome man with flowing red hair and great strength his appearance was handsome and his courage and deeds worthy of his father's name. Now one fine day Connla and his father were walking and as they reached Usna, Connla saw a maiden wearing a long flowing white dress she had skin creamy white and long flowing blonde hair and when she spoke with her voice as soothing as a stream all could hear but her great beauty only Connla could see. Connla asked the woman "From where do you come? ".To which she answered "I have come from Moy Mell, the Plain of Pleasure where there is no growing old nor is there any strife and i have come for thee fair Connla to take thee to Moy Mell as my love. ".Connla's father had heard the voice as well and although he could not see the fairy maiden he feared to lose his son so immediately he sent for his Druid Coran. Once more the Fairy Maiden spoke sweetly to Connla "A crown awaits thine comley face and handsome form and thy handsome features shall not fade until the end of all that is. ".However Coran had come and Conn begged the Druid "I call upon your assistance in this my most dire need my son is being called away by a maiden unseen her magic much too strong for my skills only you and your magic can save my dear Connla from her wiles.". Coran turned to where the voice had come from and uttered a spell of banishment but as she was vanishing away from Connla's sight she gave him an apple. One full month had passed and Connla ate nor drank except from the apple which after Connla ate from was whole again his every thought was on the Fairy Maiden until at last one day in Arcomin he saw the woman again. "The ones who live forever in the Plain of Pleasure have asked for you to come with me Connla,come with me my beloved and live forever and live in love with me in Moy Mell where King Boadag awaits with a great feast to recieve thee." Hearing her words again Conn sent his men to fetch the Druid Coran but the Fairy Queen spoke to Conn "Oh Conn the Druid's magic has little power or honor in my land he cannot help thee again. ".The king looked to his son and realizing that since she last appeared his son had said nothing to anyone asked Connla "What does thine heart tell thee my son?" Connla answered "Aye tis hard upon me for i love my own folk above all things but yet a deep longing assails me for the maiden. ".Once she heard this the maiden said "Not even the ocean here is as strong as your love come with me now in my crystal Curragh for the sun although low in the sky will not reach the sea before we are in Boadag's realm.Where we can live together forever." Without another word Connla ran to the crystal Curragh and then saddened as he was Conn bid his son farewell as the small boat vanished into the setting sun. 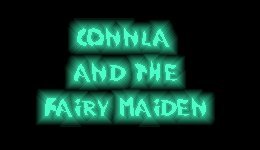 Connla and the fairy maiden were never heard from again. Conn was an actual king who ruled Ireland from 123-157 AD.The city of Connaught is supposed to be named after him.This tale is said to be based on his son Conly who was either slain or vanished during his father's lifetime more than likely the latter.Conn's son Art Enear later became king. Another name for Moy Mell is Tir Na Nog which means Island Of Youth and there are comparisons to it and Avalon.